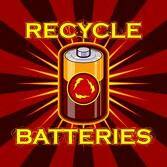 Batteries contain all kinds of toxic ingredients including mercury, cadmium, nickel, and lithium. And so what’s the problem with throwing away a little mercury? Mercury, an element naturally found in the environment, is also a very serious toxin. 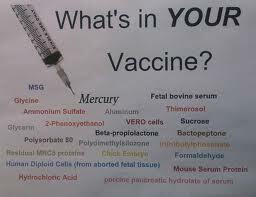 Mercury can harm the brain, heart, kidneys, lungs, and immune system of people of all ages. It has been demonstrated that high levels of methylmercury in the bloodstream of unborn babies and young children may harm the nervous system and delay cognitive development. The mercury goes into the environment and then into the food chain. How? The mercury enters the environment and it eventually settles in the water. While in the water, microorganisms transform mercury to methylmercury, a highly toxic form of mercury that can build up into high concentration in an organism. Every time the fish eat the microorganisms, they build up their methylmercury concentrations. Every organism that eats these fish is also building up their methylmercury levels. So the cycle goes on and on, and essentially you are eating the batteries – see how I did that there? Rechargeable batteries are full of all types of toxic heavy metals, etc. Luckily, the battery industry sponsors the operations of the Rechargeable Battery Recycling Center (RBRC), which facilitates the collection of used rechargeable batteries collected in an industry-wide “take back” program for recycling. And so you ask: Where do I recycle my batteries? Old batteries that were made before 1997—when Congress mandated a widespread mercury phase-out in batteries of all types—should most surely be recycled and not discarded with the trash, as they may contain as much as 10 times the mercury of newer versions. He was always different. If I had known the early signs of autism it would have been obvious that he had autism. But I had no clue what autism was. And so he wasn’t diagnosed until he was 2 1/2 even though I always knew he was different. So I don’t think my son was born typical then changed, or got a shot and suddenly had autism. I have heard many first hand accounts of that happening though, so I believe it is true and it happens. They basically break it into two categories – early onset and late onset autism. So is it the shots or not? I think it has something to do with toxins in our environment. And those toxins enter our bodies through the water we drink , the air we breathe, the food we eat, the shots we get, the paint, the plastic, the aluminum, the mercury, etc. I believe what the scientists have found in their research. I think genetics comes into play because we don’t all react the same to these toxins. Kind of like how smoking causes cancer but some people can smoke their whole lives and never get cancer. “It is believed that autism is 90% genetic. These genes aren’t all bad – sometimes they create genius! So basically I think, and science seems to be proving, that autism is genetic and those with autism have a predisposition to being affected by these toxins. So in a roundabout way – yes, the shots can be causing autism. Just as much as the water, and the food, and the plastics, and the bug spray, and the fertilizers, etc. Do I vaccinate my kids? Not anymore. They’ve already had all of the shots that I was required to have. They both have the “religious exemption” and I know what all the nay sayers say — but look at the vaccine requirements when we were kids vs today– why do they have to get so many compared to when we were kids? Requiring two chickenpox (varicella) shots in order to start kindergarten is where I drew the line.